Even after I caught (and released) the possum on Tuesday, I was pretty sure he wasn’t the culprit in the varmint chimney stay-cation. Upon returning home tonight from Meet the Teacher night at C’s school, my wife mentioned hearing something again. I grabbed a flashlight to inspect but couldn’t see anything in the chimney. After grabbing some expired tuna from the pantry, I set out to bait the trap again. While baiting the trap, I heard something moving in the dark a different direction from the chimney. I quietly grabbed the wife with camera in tow and the flashlight and managed to get this image as he headed back over the fence and out of sight. Not the greatest picture but maglite’s aren’t widely known for their photography lighting. The hole into the chimney is now boarded off with the cage right in front and a delectable array of aged tuna. Bon apetit my furry friend. Get to it before the possums do. 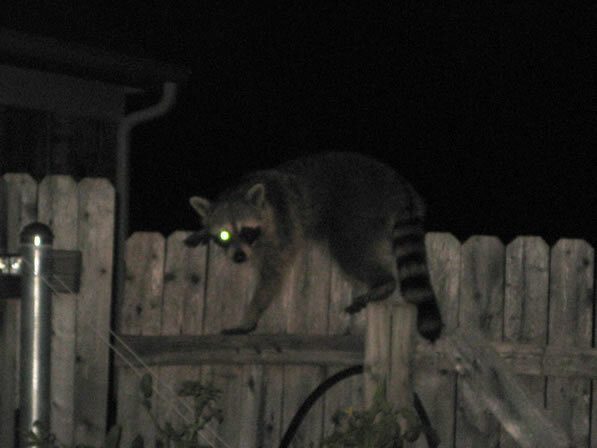 That raccoon has devil eyes. Why do you think I cried myself to sleep last night? Uh, why is this tagged under “steve irwin”? Wait, I think the better question is why would you even have the tag “steve irwin” in your arsenal? Would Bindi Irwin have been a better option?